Join us for our Power Hour Workshop on Monday 13th May at 11am. Decleor will be hosting this exciting workshop all about your skincare and how to find your glow! Our Decleor skin care therapist will guide you through the latest tips and tricks whilst you sample products in a fun interactive workshop session. Renew, refresh and rehydrate. Discover the healing properties of essential oils and learn how to create a perfect routine. 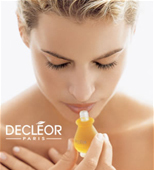 The Decleor workshop is £20 which is redeemable against the purchase of two or more products. Anyone booking onto the workshop will receive a free Decleor treat to take away with them!